Do you think you have the skills to be the next star of the Six Nations? Well the #ChuckyEggChallenge is your opportunity to show your talent to the world. To celebrate the start of the 2016 RBS Six Nations, BBC Sport is asking celebrities, pundits and fans to take on the #ChuckyEggChallenge. Pass the egg as many times as possible between the two of you in 20 seconds - passes must be like you are throwing a rugby ball. If the egg breaks, it's game over! 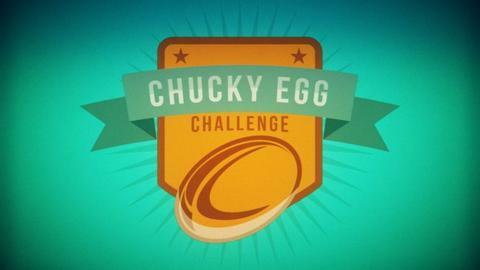 Look out for familiar faces from BBC Breakfast, CBBC, Radio 1 and our Six Nations line-up having a go at the #ChuckyEggChallenge throughout the tournament and see if you can beat them. We'll be sharing the best #ChuckyEggChallenge videos over the coming weeks and who knows, this may be the challenge that sets you on the road to lining up at next year's Six Nations.